“There is no doubt that standardisation has played a leading role in creating the EU Single Market. Standards support market-based competition and help ensure the interoperability of complementary products and services. They reduce costs, improve safety, and enhance competition. Due to their role in protecting health, safety, security, and the environment, standards are also important to the EU citizens” said Russell Patten, EVIA Secretary General. During the first session and in order to illustrate the intersection of standardisation activity and the EU’s legislative frameworks, we had the pleasure of welcoming Mr Katsarakis from the European Commission (DG GROW) who provided a very interesting update on the implementation of the CPR, harmonised standards and the European Assessment Documents for ventilation products. To control the effective functioning of the market, effective market surveillance is needed. 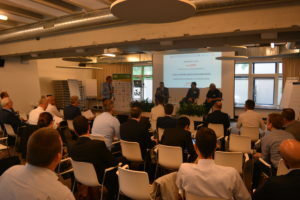 In addition, this workshop was also the perfect occasion to hear from representatives of the industry and EVIA’s national associations who are actually working on standards. Michel Rouyer (Aldes) provided a case study about Fire dampeners for Air distribution systems and Tomasz Trusewicz (SPW) presented the new regulations in Poland on Ductwork and Air distribution systems. Geoff Lockwood, the Chair of EVIA Fan Working Group (ebm-papst) provided participants with his views on the purpose of a standards committee with respect to the eco-design directive. He also shared some lessons learnt. Heinrich Huber, Manager at the HVAC Laboratory underlined non-residential ventilation aspects and especially regarding the revision of the EN 308 standard. Claus Haendel, Technical Secretary, EVIA provided the participants with an update on Residential Ventilation aspects. He shared information on the Mandate M/537, the time frame for developing the standards and also provided the participants with an update on the key changes made in EN 13141-4, -7, -8, EN 13142. This workshop was a great opportunity for all participants to gather insights on the current status of EU standardisation activities. EVIA members will further discuss and set out in the months to come the best strategy for the association to move forward in regards to Stadardisation.